There are more than 2 million weddings in the United States each year and more brides than ever are turning to 1st-Class-Wedding-Invitations.com as their preferred source for ordering custom wedding invitations. In this day and age, with hectic schedules and limited time to prepare for the special event, "what better way to select and design your perfect wedding invitations, announcement cards, response cards and thank you cards than to go online to a site where you can quickly review hundreds of distinctive options and easily create an instant online proof", says Michael Swart, Vice President of Marketing. 1st Class Wedding Invitations is one of the most successful online retailers of personalized wedding invitations and wedding accessories used by thousands of brides around the country each year. 1st Class Wedding Invitations, an Internet-based social expression company, is expanding its already broad line of wedding invitations an even greater number of invitations to choose from in addition to adding personalized wedding accessories, available next month, says Michael Swart, Vice President of Marketing for 1st Class Wedding Invitations -- we have answered our customers' requests for more options on invitation selection and accessories along with launching a new and improved layout of the web site which further enables easy viewing and customization of wedding invitations online. 1st Class Wedding Invitations has developed a state-of-the-art online preview system that allows the bride-to-be to easily create and customize her message and at the same time view exactly what her invitation will look like using an instant online proofing system. 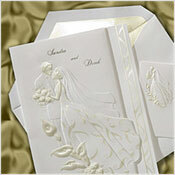 This is the time of the year when many couples begin the process of finalizing their wedding plans along with making one of the first and most important decisions which is to determine which style of announcement cards and wedding invitations they will use to invite and thank the most important friends and family members who will share their special occasion. The entire selection of beautiful and elegant wedding invitations, announcement cards, response cards and thank you cards offered through 1st Class Wedding Invitations can be personalized and tailored to suit the distinct personality of the couple preparing for a life together. 1st Class Wedding Invitations uses state-of-the-art thermography "raised lettering" techniques for a truly professional look -- in addition, high-quality personalization can include one of 17 colorful inks to match the beautifully lined envelopes. Founded in 2002, 1st Class Wedding Invitations, is an Internet-based social expression company headquartered in Plano, Texas. 1st Class Wedding Invitations sells personalized wedding invitations and accessories to thousands of individuals with orders ranging from 25 invitations to 3,000. For more information about 1st Class Wedding Invitations' business, contact Michael Swart at 1-866-700-5030 ext 107 or visit http://www.1st-class-wedding-invitations.com/.